Should we outlaw "hate crimes?" It might seem like a good idea at first. Who's in favor of bigotry and of people committing crimes because of that hatred? On the other hand, is legislation really the solution to people believing and saying things we don't happen to like or agree with? In their defense, some point out that hate crime legislation just adds additional penalties to existing crimes - true so far in the United States. Perhaps this won't always be true, but more on that in a moment. For now, the question is if it is right to legislate additional punishment because of a person's belief. Theft has a penalty under the law, for example, but should the thief get extra punishment because he felt some animosity towards whatever group the person was a part of? We already have a law that makes his crime punishable. Isn't adding extra punishment because of his beliefs just trying to make thought a crime too? Even if you like the idea, do you trust any government to properly police people's thoughts and beliefs? It's obviously contrary to our tradition of free speech. If our justice system is going to base sentences on the likelihood of the criminal re-offending, the judge can take racist remarks and beliefs into account. I don't see a problem with that approach. After all, if a criminal says, "I hate (insert group here), so I want to kill them all," why wouldn't we consider this at the time of sentencing? However, suppose a violent criminal repeatedly assaults woman. Why should he get less punishment under the law than a criminal who happens to hate the race or religion of the women he assaults? Both may be very likely to re-offend - or the former may be even more likely too - but let a judge consider that at sentencing. Laws against hate crimes are too indiscriminate, and too intolerant. Hate crime laws intolerant? Certainly the idea is that we - society or the majority - don't like your beliefs, so when you commit a crime, we'll use it as an excuse to punish you for what you're thinking and saying. Prior to the crime we can't know whether it is worse than any other similar crime, or the criminal is any more dangerous, so the point is to punish beliefs. here come the thought police. Think hate crime laws are only affecting real criminals, and so they won't affect you? Isn't it possible that the idea of controlling "bad" thought and belief will spread once the precedent is there? Is this paranoid? Already the law in Canada says "every one who, by communicating statements, other than in a private conversation, willfully promotes hatred against any identifiable group is guilty" of a felony and liable to imprisonment for two years. An "identifiable group" is defined as "any section of the public distinguished by color, race, religion or ethnic origin." These definitions expand of course, and more groups have been recently added to the protected list. A judge also found that passages in the Bible are hate literature under this law. His decision was overturned before the Bible was banned, but I agree with him - parts are very hateful against certain groups. I just think that we're better letting the marketplace of ideas take care of these issues, rather than having "thought czars" determine them for us. This is a classic "slippery slope." A company I once worked for brought in a "harassment specialist" to train us all to be "sensitive." Soon we were hearing that it was offensive for one of the old ladies who worked there to call people "honey" - and that she could be fired for it (true story). How did it come to that? Offensive is in the eye of the offended, so those who are most easily offended make the standards for the rest. This could happen with laws addressing offensive beliefs, couldn't it? Perhaps it will someday be against the law to say I think most Republican politicians are hypocrites. I wouldn't have thought so until I heard that you can't say what you want or publish a book in Canada if it is "hateful." Why not avoid this mess, and punish people for their crimes - not for what they think or believe? I hate hate crime laws because they may lead to the loss of one of our primary freedoms. There are a new batch of video iPod repairs just announced at the website ipodjuice.com for the 30GB, 60GB, and 80GB fifth generation iPod models. San Antonio, TX (PRWEB) November 30, 2008 -- With the 5th Generation iPod Video perhaps one of the popular devices to repair today, Milliamp LTD has added several new repair products and services to their website ipodjuice.com. People haunted with the decision to " repair ipod " or " buy ipod " often realize how much they can save by having their old ipod model repaired instead of discarded. 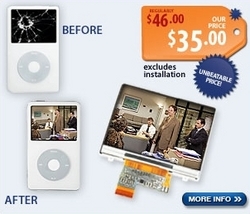 Now, in additional to getting a new battery installed, customers can have their broken video iPod lcd replaced with a brand new one that is brighter than the original one, replace a failing headphone jack, get a pristine new white or black faceplate, or a shiny new metal backplate clear of any markings or blemishes. And if your iPod Video is not working properly and you are not sure what the problem is, just have it evaluated for $9 bucks to see if the repairs are more extensive, like needing a new hard drive or logic board. "So many people love their gracefully-aging Apple iPod Video players, and they don't want a minor repair stop them from continued enjoyment," said Anthony Magnabosco, the proprietor of the iPod repair service provider that can be found at ipodjuice .com. Some Video iPod repairs (or 5th Gen iPod repairs) are simple enough for the average Joe to complete on his own, like a battery replacement. Other repairs, like changing out a new ipod video screen, are perhaps best left to the professionals at Milliamp LTD.
Oftentimes it is clear what repairs are needed - the screen is smashed, or the device doesn't hold a charge anymore. But sometimes the root cause of the issue is less obvious - the device won't connect to your computer anymore, or the iPod Video makes clicking noises. Sending your 5th Generation iPod Video to the centrally-located San Antonio-based crew is your best route, as they pounce on them the minute your device arrives to start an evaluation, and then call you back personally with a diagnosis within hours after to see if you wish to proceed with the needed ipod repair. "It is a very quick and seamless process, and it needs to be, since people want their devices fixed and back to them in better working order than they sent them," added Magnabosco. Repairs are often much cheaper than customers would expect, and make more fiscal sense then having to plunk down hundreds and hundreds of dollars for a new iPod that hasn't been with you through thick and thin. Have an iPhone or iPod nano? Well, the website ipodjuice.com can fix those Apple devices as well. Most people don't have a divorce attorney on retainer. When one is needed, recommendations from friends, co-workers or family members are valuable resources to gather information and find a person you are comfortable enough with to use. Your divorce attorney in Scottsdale will become the pivotal person in your life so your compatibility is essential. Since you will have to share details about your life that you may find painful, finding someone you communicate well with and have an easy rapport with can save you from the discomfort. Not only is your potential attorney's reputation a consideration, their fee schedule and services available through their office need to be reviewed during the selection process. You may find that they can refer a variety of services to you including counseling and financial services. When you are married, your spouse is your go-to person. Sharing the ups and downs of life, your spouse knew your personality, could read the lines on your face and knew all of your stories. From two people who were full of love and commitment to two people who cannot agree on a birthday present for their children together, divorce is a painful reminder of the failure of sustainable love. The camaraderie couples feel when they get married often disappears as the marriage moves forward. The familiarity of your spouse's likes and dislikes, activities you enjoyed together and a shared history become hurtful memories as you dissect a marriage built over time. As you begin to leave the past behind, the time comes to begin looking towards the future. Part of that process is to begin making decisions best for you and your children, if applicable. As a marriage begins to crumble, decisions once made together need to be made individually and often, the decisions made by divorcing parties are completely opposite to the other partner's wishes. The person who once was a part of every hope and every dream becomes the person whose name you most dread. Your partner becomes your nemesis. As your dissolution progresses, the support and guidance received from your attorney is a vital part of the new person you become. They help shape your post divorce life and they become a confidant as you begin picking up the pieces of your life. In the suburbs of Scottsdale, Arizona, with a wide selection of reputable attorney's, looking for personality fit may be a comfort as you grapple with issues of housing, retirement, benefits, children, schooling and other topics that plague these types of hearings. Whether you have a fairly harmonious split to a cantankerous one, having someone working for you that you trust and feel at ease talking to will help you navigate through one of the most difficult experiences of your life. Your attorney becomes a friend and confidant as you encounter new and often unexpected results of the proceedings. Don't you think it'd be wise to do your research before choosing a professional to handle such decisions? The divorce lawyer you select will become a counselor for some very important decisions. Will you negotiate on retirement benefits? Who will keep the house? What percentage of assets does each partner get? How do you handle telling friends and family about the divorce? If kids are involved, how do you tell the kids? How will the custody arrangements be handled? Not only will your divorce attorney in Scottsdale become your financial advisor, he or she will become an emotional counselor as well. Having a lawyer who will take care of your legal rights as well as keeping your financial and emotional well-being in check will ensure your future success. Andy west is a writer for Out of Court Solutions, specializing in quick and easy divorce resolution. Contact their divorce attorney Scottsdale branches while you still can. For more information please visit Outofcourtsolutions.com. Whether the court case is civil or criminal in nature, both plaintiffs and defendants can benefit from the use of a medical expert witness. This is especially true in an era where forensic technology is growing by leaps and bounds, branching off into areas like ballistic, blood spatter analysis and DNA testing. Another branch of forensics falls under the medical disciplines and can encompasses any group that provides a medicinal service to investigators or the population at large. Just what can these experts offer in the realm of traditional jurisprudence? Although most people believe coroners and medical examiners as the primary medical experts used in court trials, the fact is anyone who practices medicine in any capacity can be a medical expert witness. For instance, a chiropractor or orthopedic surgeon can attest to damages done to the spine or back during a personal injury lawsuit where a hurt plaintiff is suing for monetary compensation. On the other hand, an expert may be able to prove that the injury claimed by a money seeking plaintiff is being over blow in an effort to obtain ill gained reparations. Science itself is fairly irrefutable and with a few are notable exceptions is rarely inaccurate. This is why medical science can then be employed to prove or disprove claims on both sides of the fence. A dental expert witness is a forensic professional whose title falls under the heading of Forensic Odontologist. These individuals are also called bite mark examiners. These specialists most often establish the identity of perpetrators via teeth impressions which can be left on the skin when a homicide victim is bitten. This bite can link a killer to the deceased. The benefit of this particular type of analysis speaks for itself. A dental expert witness is utilized in situations where unidentified bodies have been located as well. In these cases, policemen generally have an idea of who the deceased individual may be and need this particular professional to confirm it. This forensic professional will most often use a persons dental records and compare them with the teeth of the unidentified individual in question. This is important in situations where a murder defendant is claiming the person is simply missing and not dead. As forensic technology continues to expand, the testimony and services of a medical expert witness will become a near standard in both civil and criminal court cases. This will lower chances of innocent people being falsely imprisoned for crimes they didnt commit and reduce the chances of the guilty walking away scot free. Medical and Dental Malpractice Consultants provide malpractice medical expert witness services, dental expert witness services, case evaluations and expert reports. When looking for medical attorney services, consider JD.MD. San Diego, California (PRWEB) November 28, 2008 -- The Law firm of Miller & Milove (http://www.cmofraud.com) today announced that a class action has been commenced in the United States District Court for the Southern District of New York on behalf of purchasers or entities who purchased or held the shares of certain mutual funds offered by the Reserve Short-Term Investment Trust, including the Reserve Yield Plus Fund ("Reserve Yield Plus Fund" or the "Fund"); during the period from July 27, 2007 to September 16, 2008 (the "Class Period"), including purchasers and holders of the Reserve Yield Plus Fund in connection with the July 27, 2007 offering. The complaint charges the Reserve Short-Term Investment Trust, its parent and affiliates, certain of its officers and trustees and TD Ameritrade Holding Corp. with violations of the Securities Act of 1933, the Securities Exchange Act of 1934 and the Investment Company Act of 1940. The Reserve Short-Term Investment Trust is an open-end, diversified management investment company. On July 27, 2007, the Reserve Short-Term Trust filed with the SEC a Registration Statement on Form N-1A, a Prospectus and Statement of Additional Information (collectively the "Prospectus"). The Prospectus emphasized the Fund's focus was to "seek as high a level of current income as is consistent with the preservation of capital and liquidity" and a "stable $1.00 share price." The Fund later issued reports characterizing the Fund as being an "enhanced cash fund" and emphasizing the Fund's focus on "safety of principal, liquidity and soundness of sleep." The complaint alleges that many of the Fund's purchasers were sold their interests in the Fund by TD Ameritrade and its employees who consistently represented to investors that the Fund was just like a money market fund. Due to defendants' positive, but false, statements, investors purchased and/or continued to hold shares in the Fund. On September 16, 2008, The Reserve Fund, an entity related to the Reserve Short-Term Trust, issued a release concerning the Primary Fund, one of its money market funds, stating that the value of the debt securities issued by Lehman Brothers Holdings, Inc. (face value $785 million) and held by the Primary Fund had been valued at zero and, as a result, the net asset value ("NAV") of the Primary Fund was $0.97 per share. This was major news, as this was only the second time in history that a money market fund had "broken the buck" - that is, reported a share's value was less than a dollar. In addition, on September 16, 2008, the NAV of the Reserve Yield Plus Fund also collapsed from $1.00 per share to close at $0.97 due to its investment in debt securities issued by Lehman. Thereafter, the Reserve Short-Term Trust suspended providing a daily NAV on the Reserve Yield Plus Fund. According to the complaint, the true facts, which were omitted from the Prospectus and other statements made by defendants during the Class Period, were as follows: (a) the Fund was no longer adhering to the stated objectives of preserving capital, but in an effort to achieve greater yields was pursuing riskier instruments; (b) despite the fact that many observers believed Lehman would be the next Wall Street failure after Bear Stearns collapsed in March 2008, the Fund purchased a large amount of Lehman commercial paper in April 2008; (c) the Fund was not designed to protect the $1.00 NAV, as were traditional money market funds, and was thus significantly riskier than money market funds; (d) the Fund's internal controls were inadequate to prevent defendants from taking on excessive risk; and (e) the Fund failed to disclose the extent of its relationship with TD Ameritrade. Plaintiff seeks to recover damages on behalf of all purchasers or holders of certain mutual funds offered by the Reserve Short-Term Investment Trust during the Class Period (the "Class"). The plaintiff is represented by Miller & Milove, which has expertise in prosecuting investor class actions and extensive experience in actions involving financial fraud. Oksana Babadzhanova, an experienced global immigration consultant and graduate of The Bryman School has joined Pro-Link GLOBAL, a niche practice of experts and specialists in the field of immigration and visa services. Phoenix, AZ (PRWEB) November 28, 2008 - PRO-LINK GLOBAL Visa and Immigration Services, focused on being your global immigration partner, with offices in the Americas, EMEA and ASIA, announces the newest addition to its Practice Team, an Immigration Consultant based out of the Arizona office. With more than seven years' experience as a global immigration paralegal for well-known U.S. law firms, Oksana brings a wealth of experience in the field of global visa and immigration processing. Her ability to manage a large volume of cases is of great merit in providing a high level of skill in a fast-paced global immigration environment. In addition to a comprehension of the processes and systems required in support of an assignee, Oksana will be assisting in the preparation of business travel visas, work permits, residence permits, letters of support, visa packets and filing applications in a timely manner at the appropriate consulates. As a native of Kazakhstan and arriving in the United States as a refugee from Russia at an early age, Oksana is able to draw on first-hand experience and knowledge that brings about a level of commitment and empathy to our clients as well as aids her in being an integral part of a unified team. Oksana is fluent in English, Russian and Farsi and has an Associate's degree from The Bryman School in Phoenix, Arizona and is currently studying to obtain a Bachelor of Science degree in Criminal Justice from the University of Phoenix. Pro-Link GLOBAL, known as the leading corporate global immigration service provider, offers concierge quality immigration services to companies in most of the 194 countries in the world today. Pro-Link GLOBAL specializing in global work permits, residence permits, entry visas, and immigration documentation as well as providing on-site training for HR personnel in their global compliance requirements. Pro-Link GLOBAL, headquartered in Florida, USA, has a physical presence in 95 of the key global destinations. In countries where Pro-Link GLOBAL does not have a physical presence, they work in integrated professional consulting teams with other outside immigration specialists who are known as Keiretsu Global Network Members or PLG |KGNM. Pro-Link GLOBAL offers a free subscription to their bi-monthly e-bulletin called "Global BRIEF" which is filled with the latest breaking news in global immigration law. For more information about PLG, the KGNM or corporate global immigration services, please contact Michele Longley, Director, Global Business Development at +1 941 761 1495 or visit the website www.pro-linkglobal.com. Square Mile Productions Limited (www.squaremilevideos.com) has released through online streaming the latest production of Black Into White '09 which has been acclaimed as the most effective anti-money laundering (AML) training video currently available to the wholesale financial sector. London UK (PRWEB) November 28, 2008 -- Square Mile Productions Limited (www.squaremilevideos.com) has released through online streaming the latest production of Black Into White '09 which has been acclaimed as the most effective anti-money laundering (AML) training video currently available to the wholesale financial sector. David Gordon, who was formerly Head of Compliance at Nomura International and Compliance Committee member at LIBA and is now Executive Director at www.squaremilevideos.com, said: "With the 3rd Anti-Money Laundering Directive now in force firms need to demonstrate the substance, take-up and effectiveness of their anti-money laundering training to the Financial Services Authority (FSA). www.squaremilevideos.com products substantially help firms to achieve this. We have aligned ourselves with leading investment banks in delivering this high quality documentary style training product that adds more value to our clients business than any other similar product." The product comes in two sections - The first section is a 20 minute online video that is streamed directly to employees' desktops thereby reducing the downtime for traders. The video Black into White 09 was previously available in DVD format but has now been updated to reflect the current economic climate, SOCA and the requirements imposed by the Third EU Money Laundering Directive. The second section consists of an online Q&A that the employees complete after viewing the film to assess whether they have understood the key lessons from the video training session. The results are then collated and sent directly to a nominated person in the compliance department to streamline the process of record keeping, a key regulatory requirement in compliance training. This innovative approach means that business-critical employees such as traders can remain at their own desks or workspaces thus saving downtime and resources whilst complying with these important regulatory requirements. www.squaremilevideos.com combines nearly 50 years of experience in the compliance, film production and corporate solutions industries, bringing financial organisations the best quality compliance training videos online. The team has helped many clients solve various business problems through innovative use of technology related solutions and have won awards such as The Good Director 2008 award from the IoD in the Education and Development category; Young Business Person of the Year 2005 award from ITV and London Chamber of Commerce; Mayoral Award from the Mayor of London for outstanding contribution to life in London and many others. Manchester, UK (PRWEB) November 28, 2008 -- The latest addition to the Shred Easy range of mobile shredding vehicles was unveiled on the 13th November 2008 at our Head Office in Trafford Park, Manchester. It will soon be a common sight in city centres throughout the UK from Monday 23rd November 2008 offering on-site shredding services. Shred Easy is leading the way in the race to produce a mobile shredding vehicle for a comprehensive document destruction service which truly meets the objective of minimising carbon emissions. The result is a smaller, lighter and quieter vehicle for onsite document destruction. It operates with a more compact engine than its predecessors. The reduced weight means that it uses less oil and less fuel in normal transit and during the shredding process. Consequently there is an improvement in cost efficiency, an increase in environmental benefits and a substantial decrease in noise levels. The Shred Easy 'UrbanShredder', with its ultra-low Gross Vehicle Weight (GVW) of only 7.5 tonnes, is the most advanced mobile document destruction unit operating in the UK today. It is the only environmentally friendly vehicle to bring secure destruction services to your door. Also, the dramatic reduction in GVW means that the power-to-weight ratio of the 'UrbanShredder' is without equal. With 180 horse power channeled through such light-weight technology, the UrbanShredder is streets ahead of the competition. The 'UrbanShredder' treats exhaust gases via Selective Catalytic Reduction technology (SCR). SCR technology reduces particulate emissions by decreasing the nitric oxide levels through the post-treatment of exhaust gases. The greatest advantage of SCR technology is that it allows a significant decrease in fuel consumption (up to 5%). In addition, this technology is already able to meet the Euro 5 emission standards, which is coming into force in 2009. SCR technology uses only one chemical reactant named AdBlue (water solution of urea), which reacts with the nitric oxides once it has been sprayed into the exhaust gases and transforms them into harmless substances. The consumption of AdBlue is usually within 3% and 5% of fuel consumption. The SCR makes the PM filter redundant, since the production of particulate is minimal. It allows a reduction in fuel consumption and in the cost of manufacturing engines, but at the same time improves the performance and extends the life of the motor-propulsion units. On the other hand it allows full compliance with rigorous Euro 5 emission standards established to safeguard the environment. In addition the very low level of particulate produced through combustion reduces the contamination of the lubricating fluid oil and allows extended maintenance intervals, which further enhances the 'UrbanShredder's' productivity. At 6.0 metres in length, the 'UrbanShredder' is the shortest mobile shredding vehicle on the market. Its maneuverability, coupled with a greater range of driver options, enables us to provide an even higher level of service. Furthermore, while the truck size has been reduced, the shred speed remains unaffected, offering a comprehensive shredding service. Shred Easy is the UK's leading provider of confidential data destruction services. Shred Easy provides a bespoke, convenient and total solution for the secure shredding and disposal of confidential data and materials including paper documents, hard drives, IT equipment, uniforms and clothing. Shred Easy is a member of the British Security Industry Association and is registered in accordance with the Data Protection Act 1998. Shred Easy holds UKAS ISO9001 accreditation. Shred Easy also implements an environmental programme and is UKAS 1SO140001 accredited. All paper is recycled, trees are planted on behalf of customers and vehicles are scheduled on green routes minimising carbon emissions. Record of verdicts and settlements reached in auto accident, medical malpractice and other injury cases. Rochester, NY (PRWEB) November 28, 2008 -- The lawyers of Scott C. Gottlieb & Associates, LLP, a personal injury practice in Upstate New York, have just surpassed a milestone few attorneys ever reach: the $100-million mark in total verdicts and settlements. "We've worked long and hard for our personal injury clients, and we're proud of our track record of success in the courtroom and at the settlement table," said partner Scott C. Gottlieb. But our achievements on behalf of our clients illustrate the dedication and efforts that we put into each and every case. "Every case stands on its own merits, and our prior results do not guarantee a similar outcome in future claims," Gottlieb said. "But our achievements on behalf of our clients illustrate the dedication and efforts that we put into each and every case." Gottlieb said that $100 million in verdicts and settlements have been recovered by lawyers who are current members of The Law Offices of Scott C. Gottlieb & Associates, LLP. Some of the verdicts and settlements occurred before the lawyers joined the practice, he said. Motor vehicle accidents. Recoveries have included a $1.1 million verdict for a victim who suffered head injuries in a car wreck, and an $800,000 settlement for a victim who suffered multiple fractures in another accident. Medical malpractice claims. The firm's recoveries include a $6.1 million verdict over alleged malpractice by an anesthesiologist. Dog bites. The firm negotiated a $100,000 settlement after a dog bite left a victim with facial injuries. ATV and boating accidents. Multiple injuries in an ATV accident resulted in a $375,000 settlement negotiated by the firm. Birth injuries. Among the firm's many recoveries is a $5.15 million verdict in a birth injury case. Brain and head injuries. The firm negotiated a $4.5 million settlement following a truck accident that left a client with severe brain injuries. The firm has also had success in wrongful death claims, cancer misdiagnosis claims, hunting and firearms accidents, construction accidents, and slip and fall injuries. The Law Offices of Scott C. Gottlieb & Associates, LLP handles all types of injury and medical malpractice cases. Each of the firm's attorneys has more than 25 years experience handling injury cases. In Rochester, The Law Offices of Scott C. Gottlieb & Associates, LLP are located at Suite 505 Irving Place, 30 West Broad Street, where clients are seen by appointment. The firm also has offices in Binghamton, Elmira, Watertown and Syracuse. For more information, contact the firm at (800) 825-5529 or visit the firm's Web site at http://www.rochesterinjury.com/index.html. Nine years after its use was banned, statistics show that nearly 4,000 people in the UK die each year from the effects of asbestos exposure whilst at work. Manchester,UK (PRWEB) November 27, 2008 -- On 24th November 1999, the Government's ban on the use of Asbestos came into force. Nine years on, statistics show that nearly 4,000 people in the UK die each year from the effects of asbestos exposure whilst at work. This figure, as predicted in 1999, exceeds the number of people killed in Road Traffic Accidents and the figure is set to rise. Yet despite these shocking figures, tradesmen and women continue to become exposed and fail to recognise that dangers still exist. The dangers of exposure are still so great that the Health & Safety Executive are currently running a campaign highlighting their concerns. Although white, blue and brown asbestos have all been banned in the UK, the material remains in the fabric of some 500,000 buildings in the UK. But many workers seem to believe that the ban means no future exposure is likely. This couldn't be further from the truth. Exposure is still possible if cutting or drilling disturbs the asbestos fibres during any refurbishment of a building built before 2000. If asbestos is damaged whilst being worked with, the fine fibres become airborne and can be inhaled. Whilst protective clothing such as face masks is available, it is not always used. Partners of workers can even be exposed to asbestos from coming into contact with their clothing. Those most at risk work or have worked in the following trades: plumbing; building and bricklaying; roofing; ship building; flooring and carpentry and joinery. There's no known safe level of asbestos exposure. Put simply, the higher the levels of asbestos and the longer the time someone is exposed to it, the greater their risk of developing problems. Only now are we experiencing the after effects of exposure to the killer substance used extensively in the 1970s. The risk of asbestos-related diseases is increased significantly for smokers. Related diseases don't tend to appear for many years, often between 25 and 40 years after exposure. Asbestos can cause thickening of the pleura, the membrane which lines the outside of the lung. If the thickening is severe, lung function is restricted causing shortness of breath. It can also cause Mesothelioma, a rare form of cancer. Medication can relieve symptoms and improve breathing but there is no cure. Michael Jeffries of First Personal Injury comments "If your job has exposed you to asbestos and been harmful to your health, you could be entitled to Industrial disease compensation. Many victims are workers from ordinary backgrounds who have been exposed to asbestos in the course of their occupation, often without any protection or prior warning of the dangers. Something as simple as the repeated removal of old lagging from pipe-work could have provided sufficient exposure to lead to a devastating health problem up to 40 years later. We can offer free initial advice, and confidentially help victims decide if a claim for compensation is possible. Regrettably we can't undo the damage to victims' health, but we can take legal steps to ensure that family circumstances are appropriately compensated for future needs". First Personal Injury works closely with experienced Medical Experts in order to ensure best possible outcomes. If you are worried, it is important for you and your family to make immediate contact with http://www.firstpersonalinjury.co.uk/accident/industrial-accident-disease/index.html [industrial disease claim experts at First Personal Injury who will handle all aspects of a compensation claim. Take the first step and contact Firstpersonalinjury.co.uk for further assistance and free, confidential advice. Although intended to be a time of relaxation, it is still possible to have an accident whilst on holiday. The types of accidents that happen abroad are largely the same as ones that would happen at home, but with a few additions. These additions arise due to the fact that people on holiday participate in high-risk activities that they wouldnt normally do at home. For example, many accidents happen on or in water because of the number of water sports and activities available, particularly at coastal destinations. Other accidents can happen on board boats, trains, in hired vehicles and in planes. Many of these accidents are unique to a holiday environment, and someone seeking compensation needs a highly specialised solicitor to help make a holiday accident claim. When you go on holiday abroad it is vital that you have some kind of holiday insurance. There are now so many companies that provide excellent holiday cover that consumers are spoilt for choice. Decent holiday insurance should cover almost any eventuality, and ideally be tailored to include any high-risk activities you may want to participate in. Holiday insurance should also cover loss of luggage, theft and loss of travellers cheques and credit cards. Holiday insurance can often be purchased on an individual holiday basis or on an annual basis, depending on your requirements and how often you travel abroad. If you are involved in an accident abroad then there is a good chance that you will be admitted to a hospital. Your travel insurance should also be able to cover any medical costs for treatment or medication. If you are admitted to hospital you will need to follow very strict procedures in order to ensure that you are safe and that any holiday accident claims you may make are unhindered. If you are on an organised or package holiday, then you should notify your holiday representative or tour guide, as they will be able to help. If you are not on a package holiday, then you will need to contact your nearest embassy. Both your embassy and holiday representative will be able to keep in touch with you, notify your family, and help with insurance companies. Upon returning to the UK you need to contact your insurance company yourself and follow the claims procedure. Sometimes you may want to seek further legal representation and make a holiday accident claim for further compensation. If this is something that you decide to do, then you will need to approach a company that specialises in this type of claim. A specialist company will usually have a number of solicitors well versed in the legal issues surrounding accidents abroad and how to seek compensation. It is important that you contact one such company as soon as you can upon your return. This is especially the case with accidents on planes or boats as the legal issues involved are unique. The majority of companies offering representation work on a no win, no fee basis for holiday accident claims. This means that they will claim for their own payment from the party responsible for the accident, along with your compensation amount. You will receive 100% of the compensation amount that you claim for and no money will be taken out of this amount for legal fees. The amount of compensation varies depending on each individual case and there are a number of factors involved. For example, further loss of earnings due to your injury and changes that may need to be made to your house or car as a result of a holiday accident will be taken into account. We deal in a range of claims, including personal injury claims and compensation. Please visithttp://www.1stclaims.co.uk for further information. Asbestos poisoning is a very serious issue, more serious than many people realise. Asbestosis is responsible for more work related deaths in the UK than any other type of work related accident or disease. It is said that six joiners die every week from asbestos poisoning. If you have been diagnosed with asbestosis within the last three years, you may be able to make an asbestos claim and sue the company that you were working for. In fact nowadays more and more people are making claims for asbestosis than ever before. In 1991 there were over 700 claims where asbestos was cited as the primary cause of illness. By 2004 that number had risen to over 1800 claims as more and more people discover they have asbestosis. The seriousness of asbestos poisoning is also demonstrated by the Health and Safety Executive (HSE) launching their 'Asbestos - the hidden killer' campaign. This campaign, which is aimed at tradesmen who may be at risk, is to raise awareness of the dangers of asbestosis and ultimately save lives. There are safety procedures that can be followed in order to help reduce risks and this campaign also seeks to educate people in these methods. This campaign, which is now being rolled out nationally, was trialled in the North West and proved highly successful. It is hoped that this success can be repeated across the UK. The campaign comprises of various advertising and public relations elements in order to target as many tradesmen and businesses as possible. There will be adverts on major radio stations and in the national press. Adverts will also appear in trade magazines in order to appeal directly to their target audience. Campaign materials, such as posters and fliers, will also be sent out to plumbers, electricians, joiners and other tradesmen. A number of case studies are also being developed at a national level which will then be used to help inform those that need to be aware of the risks of working with or in the vicinity of asbestos. If you have been diagnosed with asbestosis, or mesothelioma, and wish to make an asbestos claim, there are certain things that you should know and do. The first thing that you need to do is approach a specialist claims company who have experience in asbestos claims. It is best to make sure that the company you approach is a member of the Association of Personal Injury Lawyers (APIL). A company that specialises in such claims will have experience and knowledge of previous asbestos claims that have made it to court. Many companies will be able to manage your asbestos claim at no cost to yourself. Any fees that they charge will be recovered from the party that is at fault. The compensation that you receive from such a claim will vary according to the severity of your condition and depending on the circumstances surrounding your claim. Typical settlement amounts can be quite large however; many are upward of £100,000. Most companies will also ensure that you receive 100% of the compensation amount that you claim for. We deal in a range of claims, including personal injury claims and compensation. Please visit http://www.1stclaims.co.uk for further information. Although the NHS does strive to deliver high service levels and an excellent quality of care, it does sometimes make mistakes. Nowadays, the NHS is more open about what patients should expect from it as a service provider, which means that if something goes wrong, more people decide to sue the NHS. Whilst some claims are 'nuisance claims', inspired by more awareness of the ability to make a claim for compensation, many claims are genuine. Amongst these claims there are a rising number of medical negligence compensation claims. One victim of medical negligence was driving at around 45 miles per hour when he rolled into a verge. After the accident he was taken to hospital and diagnosed as suffering from whiplash. The doctor that treated him prescribed him painkillers and an ibuprofen gel and sent him home without an x-ray. It is said that the pain was so excruciating that later that day, whilst applying the ibuprofen gel, the victim passed out. He returned to the hospital and the doctor repeated the initial diagnosis and sent him home again. Several weeks later, and still in a great deal of pain, the victim visited an osteopath in the hope that some of the pain could be alleviated. The osteopath was concerned and, when hearing that the victim hadn not had an x-ray, referred him immediately. Upon having the x-ray it was revealed that the victim had a broken neck. The victim went into surgery and had pins and bolts inserted into his neck, as well as a bone grafted from his hip. The victim, who was a student studying sports science at university, was also told to refrain from sports for a year, impacting both on his life and his studies. Although an extreme example of medical negligence, this story does go to show that mistakes do happen. Luckily the NHS uses such incidents to learn from and to help improve their level of service and quality of care. If you intend to sue the NHS, there are certain things that you need to do. In the first instance, you will need to approach a specialist company that deals with such claims. The laws surrounding cases related to the NHS are extremely complex and a specialist solicitor is a necessity. Not only will they know how to proceed with such cases, but they will also be aware of similar cases that could have a bearing on your own. You will also need to gather as much information as you can to use as evidence and validate your claim. You will need to keep a record of all pertinent dates and make notes as to what happened at all appointments. You will need to collect the names of any doctors and the addresses of surgeries or GPs that you visited regarding your injury. Finally, you will need to give your own personal details and a statement detailing the nature of the medical negligence you have suffered will be prepared by your solicitor. Once you have all of this information then you will be in a more stable position to sue the NHS. Your solicitor will then be able to advise you on how you should proceed, as well as help you to find appropriate funding options. We deal in a range of claims, including medical negligence and compensation. More and more patients are deciding to sue the NHS for clinical negligence. This demonstrates that people are more aware of their rights and better informed about the service levels they should expect from the National Health Service. There is a paradox here because as the NHS improves quality of service and makes their service more transparent by informing patients of what they should expect, more and more people initiate a case against the NHS due to any failure or dissatisfaction in the quality of care provided. In 1990 legal claims nationally cost the NHS £65.5 million. This figure rose to £560.3 million in 2005/2006. It is said that in some hospitals the number of claims have risen by 300% in the same time period, with an average number of claims being 60 per annum. The NHS Litigation Authority estimates that at present there are around £8.22 billion worth of outstanding claims throughout England and Wales. Claims against the NHS are dealt with under the CNST (Clinical Negligence Scheme for Trusts) guidelines, which ensure that claims are dealt with efficiently and effectively. The current length of time that it takes to deal with claims is 1.46 years. Patients who sue the NHS must make sure that they have a genuine and valid claim. The NHS receives many 'nuisance claims' that have little or no merit. It is very unlikely that these claims will be settled in the claimant's favour. With all claims the NHS Litigation Authority will carry out a risk evaluation to assess the NHSs chance of losing. If the NHS determines that it may lose it will obviously make a settlement. However, with nuisance claims the NHS is unlikely to lose and will therefore not make a settlement. A claimant making such a claim stands to lose a lot of their own money and this makes such claims ultimately counterproductive. The fear of making a nuisance claim shouldn't hinder the making of genuine claims. Genuine claims can be settled out of court or go through court proceedings. It is important for genuine claims to be made because they highlight areas of negligence within the NHS that can then be worked upon and improved. Ultimately these claims help improve the overall service of the NHS and the quality of care provided for all clients. Patients who sue the NHS should be aware that the law in this area is extremely complex. Because of this complexity it is important to seek out specialist legal advice and representation. When you approach solicitors you should ensure that they are members of the Action for Victims of Medical Accidents (AVMA). You will also need to decide how your claim is going to be funded. Finally you will need certain information to substantiate your claim, such as your own personal details, details of the doctors or specialist who have provided treatment, the address of hospital attended and a list of pertinent dates. Monterey College of Law announced nine new lawyers from the July 2008 California Bar Exam results released Friday, November 21. The class of 2008 has three new lawyers; Gina Occhipinti, Maria Palazzolo, and Stephen Pribula who join four classmates who passed the previous February bar exam. Six MCL graduates from previous classes also passed the exam; Regina Beeson, Daniel Bozzo, Sharon Christensen, Caroline Forbes, Jeremy Peck, and Magnolia Zarraga. Seaside, CA (PRWEB) November 27, 2008 -- Monterey College of Law announced nine new lawyers from the July 2008 California Bar Exam results released this past Friday. The class of 2008 has three new lawyers; Gina Occhipinti, Maria Palazzolo, and Stephen Pribula who join four classmates who passed the previous February bar exam. Six MCL graduates from previous classes also passed the exam; Regina Beeson, Daniel Bozzo, Sharon Christensen, Caroline Forbes, Jeremy Peck, and Magnolia Zarraga. Mitch Winick, Dean of MCL, stated, "We are very proud of our nine new lawyers. Passing the California bar exam is one of the highest professional achievements because it is such a difficult exam." Recognized as the hardest bar exam in the country, the State Bar of California reported a 61.7% overall pass rate for all applicants for the 2008 July Bar exam. "The MCL class of 2008 has achieved a 50% pass rate for the February and July bar exams, which is very competitive for a state-accredited law school," according to Dean of Admissions Wendy LaRiviere. "Of course there is a friendly competition between the class of 2008 and the class of 2007," added Winick. The class of 2007 also added three new lawyers based on the July results, raising their overall pass rate to 71%. "I fully expect similar results from the class of 2008 once they get their chance to repeat the exam during the next year," said Winick. "With so many of our graduates working full-time, it is very common for MCL graduates to take the bar exam more than one time. The fact that we had six successful repeat-takers this time is a testament to quality of our program and the dedication and persistence of our graduates," said Winick. MCL is planning a public swearing-in ceremony at 4:00 p.m., Thursday, December 4, 2008 at the Watsonville Courthouse, 1 Second Street, Watsonville, CA 95076. The law school also welcomes local graduates of other law schools who passed the bar and who would like to participate in the swearing-in ceremony. Contact Amy Waynar at the law school (831) 582-4000 or awaynar(at)montereylaw.edu for information. Chicago, IL (PRWEB) November 27, 2008 -- BD-BrandProtect, the leader in online threat protection, today announced the launch of a Troubled Assets Relief Program (TARP). BrandProtect's TARP program provides assistance to companies recently damaged by illicit internet activity such as phishing, product counterfeiting, traffic diversion and mis-use of trademarks. BrandProtect's TARP program helps corporations damaged by Internet threats improve confidence by monitoring phishing attacks and conducting take-down operations against criminals that redirect web traffic to illegal web sites, abuse trademarks and names, steal SEO optimization from legitimate brands and erode brand reputation. "Improving customer confidence in e-commerce channels is a new priority in this recession along with the reclamation of stolen Internet assets," said Michael Kiefer, General Manager of BrandProtect. "The violation of intellectual property rights has reached epidemic proportions. Heightened visibility of gray market and counterfeit goods on the Internet is a top concern in 2009 for most Brand Protect contracted manufacturers, given the hundreds of billions of lost revenue needed to be reclaimed. TARP is our response to concerned customers"
BrandProtect is recognized for its comprehensive threat protection solutions for large institutions and global brands. TARP, created in 2004 and honed over the last four years, is the result of an initial proposal that was approved by more than 3500 customers in 2007. The TARP program is based on BrandProtect's enterprise-level intellectual property rights (IPR) solution that assists companies in reclaiming lost Internet revenue, at an affordable price. "In these troubled times, we are helping companies stop organizations that dilute and defame their brands, revenue and reputation," said Kiefer. "We scour the internet looking for brand, trademark and trade name infractions by organizations that are stealing your brand, stealing your search and selling your products in the counterfeit, black or gray markets. This is a critical time for revenue and reputation rights and solely working with a domain registrar for web IP protection is not enough." BD-BrandProtect, the leader in online threat protection, empowers organizations to gain control over how they are represented online. The company's services help organizations detect, uncover and take down online threats to their brands, such as phishing, fraud, copyright infringement, web traffic diversion and more. By combining advanced technology and around the clock human analysis, BrandProtect filters, reports and takes action on the threats that present the most risk to a brand. Recognized for its response services that help organizations detect, uncover and take down online threats to their brands, BrandProtect was the first company of its kind to be offered full membership by the Forum for Incident Response and Security Teams (FIRST). BrandProtect has relationships with more than 2,000 Internet Service Providers globally that account for more than 85 percent of the traffic flowing across the Internet. Founded in 2001, BrandProtect is headquartered in Toronto, Canada, with offices in the United States, Singapore and London. For more information, visit http://www.bdbrandprotect.com. Albany, NY's Martin, Harding & Mazzotti personal injury law firm sponsored Choices 301's Cab, Cop or Coffin Program. This program raises awareness on safe driving issues for kids and adults. ALBANY, NY (PRWEB) November 27, 2008 -- Martin, Harding & Mazzotti, LLP sponsored Choices 301's Cab, Cop or Coffin Program in July of this summer. This program raises awareness on safe driving issues for kids and adults for topics such as the importance of safe driving, the use of seat and lap belts, observance of proper speed limits and especially the need for abstinence of alcohol and other drugs when operating motor vehicles. Choices 301's program takes a multi-faceted approach aimed at educating the public about the realities and dangers of DWl, aggressive and extreme driving behavior and the failure to utilize the proper passenger restraint devices in motor vehicles. we are working hard to bring the basic philosophy of our firm - that we must do all we can to help bring safety to the community for everyone, when and wherever we can. we are fortunate to be able to partner with such a fine organization such as Choices 301. We are very proud to offer Cab, Cop or Coffin and work closely with Choices 301. The program was presented with Choices 301 at the Choose Life celebration held at Albany, NY's Taft Furniture on July 14th, 2008. The program was free and open to the public. The Choices 301 program consisted of a Mobile Traffic Safety Awareness Exhibit and display which focused on the dangers of Driving While Intoxicated (DWl), Aggressive/Extreme Driving and the crashes, injuries and deaths which can and do result from one poor choice or bad decision. Martin, Harding & Mazzotti's managing partner, Paul Harding says, "we are working hard to bring the basic philosophy of our firm - that we must do all we can to help bring safety to the community for everyone, when and wherever we can." Choose Life was a day filled with celebrating life and learning more about everyday life issues such as automobile and fire safety and prevention, health and fitness, motorcycle safety and NYS approved child restraint assistance and information. Safety demonstrations were conducted by members of the Colonie Police and New York State Police. Harding continues, "we are fortunate to be able to partner with such a fine organization such as Choices 301. We are very proud to offer Cab, Cop or Coffin and work closely with Choices 301." Additionally, information was available on Blue Star Mothers, Capital Region #2 Chapter, DWI displays, organ donors, SPARC - St. Peter's Addiction Recovery Program, stock cars and drivers, stop smoking programs and suicide prevention. As an added bonus, in honor of Flag Day, the US Marine Corp and the NY Army National Guard participated in raising a 40 by 60 foot American Flag. For additional information on Martin, Harding and Mazzotti, LLP, please contact Clark Supley at 1-800-Law1010 or visit them on the web at http://www.1800LAW1010.com. Founded in 1994, Martin, Harding & Mazzotti serves clients throughout Upstate New York, Massachusetts and Manchester, VT. They are scheduled to open a new office in Utica, NY in December 2008. The firm funds extensive community outreach and support initiatives and has extensive plans to do so into the future. Please contact them for details.